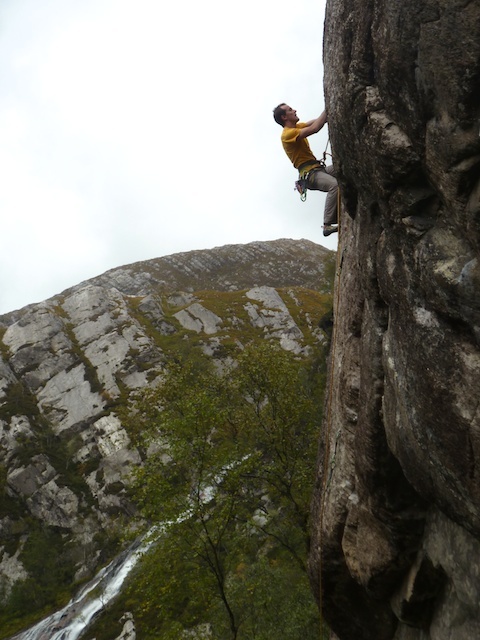 In my last blog post I mentioned that I had a few wee routes to finish off before I was completely done with Steall. I do like finishing things before moving on, so I was eager to get them done. 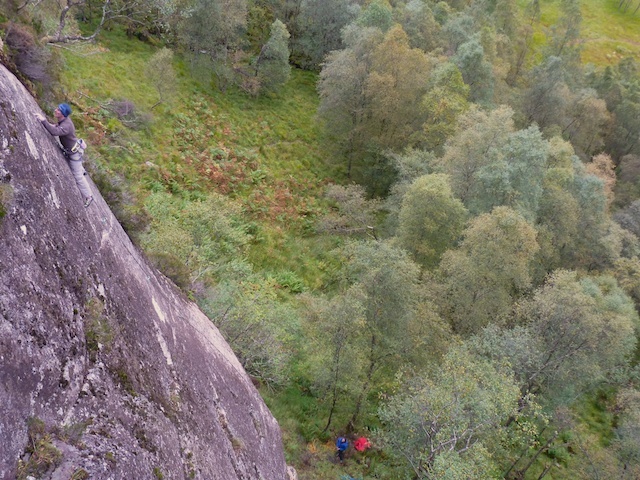 I’d bolted 5 new routes on the left side of the crag, two on the left arete of the main crag and three on either side of the big slab to it’s left. All needed a good brush since they are a bit slow to dry compared to the other lines, but the rock is great with lovely little pockets and every so often these weird letterbox jugs that are just the most satisfying holds ever! End of the Line 6b+, first ascent, Steall. I’d bolted the routes and partially done the hard work of cleaning them on previous visits. With three dry days gone, three of us went up to try and get them cleaned and climbed before they got wet again. All was going well, a new 7b, 6c and 6b+ were in the bag. But then it went a bit pear shaped. 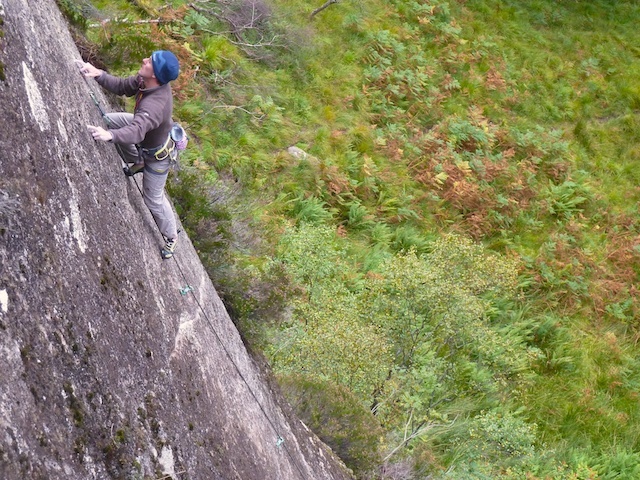 It turned out, the 6b+ slab was quite long and the rope I was using which wasn’t mine was a little short. As I got lowered off, the rope ran out about 6-8 feet above the small ledge at the start of the route proper. Neither of us noticed in time and so I plummeted, clipping the ledge with my foot and somersaulting down the turfy scrambling ground below, eventually coming to a violent stop wrapped around a birch tree on the slope below. As I was flying head over heels I was wondering what the hell was going on! Normally I always take a long rope to the crag so rope length issues don’t arise and it hit me that the borrowed rope I was using must’ve been too short and the end had gone through the belay device. For a minute or two I thought I might have got away with it but very quickly my right foot started to get bigger and severely object to being weighted. A rather nauseous hop/clamber/crawl down to the wire bridge followed. The bridge was fine thanks to my practice on the Stac of Handa. After that, the machine that is Kev Shields carried me most of the way back through Steall gorge to the car and a trip to the Belford. A good man to have around when things go wrong! It appears my ankle is not broken but it looks likely I have a grade II tear of my plantar fascia (foot arch) and will be on crutches for a few weeks. It’s still early days to get a close idea of exactly what’s been mashed and bashed inside my foot. On the bright side, I was about to start the yearly retreat to the fingerboard to avoid the autumn deluge and begin my foundation of strength training for the season anyway. So now I’ll have a even more focused start to that. I might even finish writing my book too. A few weeks out of immediate performance goals to really build a base of finger strength is something I should have been doing much more of in previous years. It will be really interesting to see if it yields a positive effect. I know where I’d place my bets! I took day 1 post-injury off since I felt pretty damn sore all over and sorry for myself. But yesterday (day 2) I started gently with an hour and a half session of deadhangs, pull ups, antagonist work and flexibility training. My neck still felt a bit sore from the somersaulting down a crag, so I felt pretty weak and tentative. But that will give me good motivation to climb out from the hole. I feel awful I’ve had to cancel a coaching trip I was due to go on next week, and a trip right afterwards to the trad area of Bohuslan in Sweden that I was greatly looking forward to. But both can be done when I’m stronger, healthier and have the book finished. So no there is no time to waste! I’ll be back on the cliffs in 4-6 weeks and have a lot of deadhangs and writing to fit in before then. Best get stuck in! [UPDATE] I wrote the above on day 3 post accident. It’s now day 6 and I’ve already made a bit of progress. 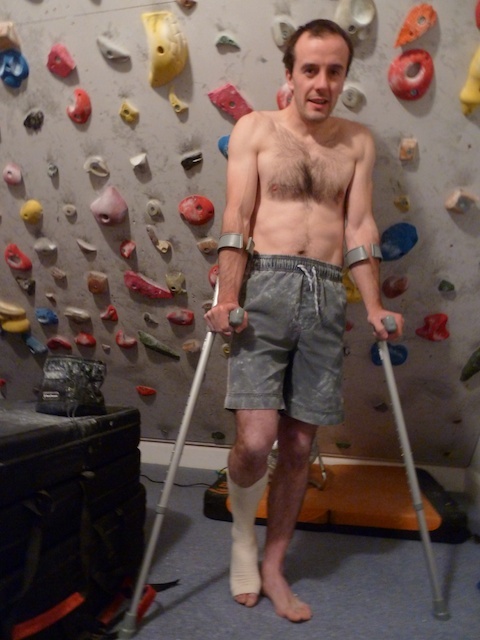 I started early mobilisation on day 4 and have got 80% ankle range of movement back from about 20% on day 1. I can rest the weight of my leg on the ground now and even get 10kgs of force through my forefoot pain free. Looking good! Nice blog but I am sorry for your leg..Get well soon..Climbing and reading blogs on climbing excites me a lot...Heading to Nepal for climbing again with Ramdung Expeditions P. Ltd..
http://asianexpedition.com/..they are quite good and experienced expeditions company in Nepal. Phew, the simplest things are often what trips us up! I guess the two habits to change would be a knot in the end of the rope and checking rope length? Always easier to look back with hindsight and say "I should've...". Heal up fast! Inspiring to hear such a positive attitude! Dave, I reckon that strong body of yours will rebound in no time! Have you ever thought of trying some crawling as rehab ? good for the wrists and shoulders and also good for the dorsiflexion. Try 5 to 10 steps at a time crawling im curious to know what you think. Your daughter might think its a race ! Great to see the positive spirits, that's an inspirational way to tackle setbacks! But what a shame that we don't get to see you in Bohuslan! It's really one of the most amazing trad areas I know. Hope we'll see you in spring instead? I hope this can work as a good reminder for evryone to always put a knot in the end of the rope. Dave; thank your lucky star nothing more serious happened. A friend of mine had a similar accident, fell about 15 foot and was paralyzed from the waist down. She will probably be in a wheelchair the rest of her life. I'm glad to see the positive spirits,We should always be given our hundred plus,very well describing good to see you back, i hope some good things happen with you in your life. Get well soon Dave! All the best for your foot. Get well soon, and check that knot!